I always have some form of granola or snack bar stashed in my purse, for when I'm out running errands and realize it is snack time. Yet, I still haven't found a brand I really like. You'd think that I'd give up and just find some kind of alternate snack to carry around (like ... just mixed nuts and chocolate bars? ), but alas, I keep trying new bars. I'm determined. Taste of Nature makes a variety of snack bars, all USDA certified organic, gluten-free, vegan, kosher, non-GMO, low glycemic, blah, blah, blah. Made from nuts, seeds, and fruits. Nutritionally, and buzzword wise, their bars offer a lot. Unfortunately, I didn't really like them. "A Brazil-inspired, festive blend of certified organic nuts, seeds, fruit and crispy brown rice." The bars also don't contain mystery ingredients. The nuts are a mix of peanuts, almonds, brazil nuts, and walnuts. For seeds, there are sunflower and pumpkin. The "fruit" is just raisins. Besides the whole grain brown rice, the only other ingredients are the sweeteners, agave nectar and brown rice syrup of course. And, it tastes like the sum of its parts. Nothing more, nothing less. A bunch of seeds mostly, with some bits of nut in there, and a few sweet chewy bits of raisin. 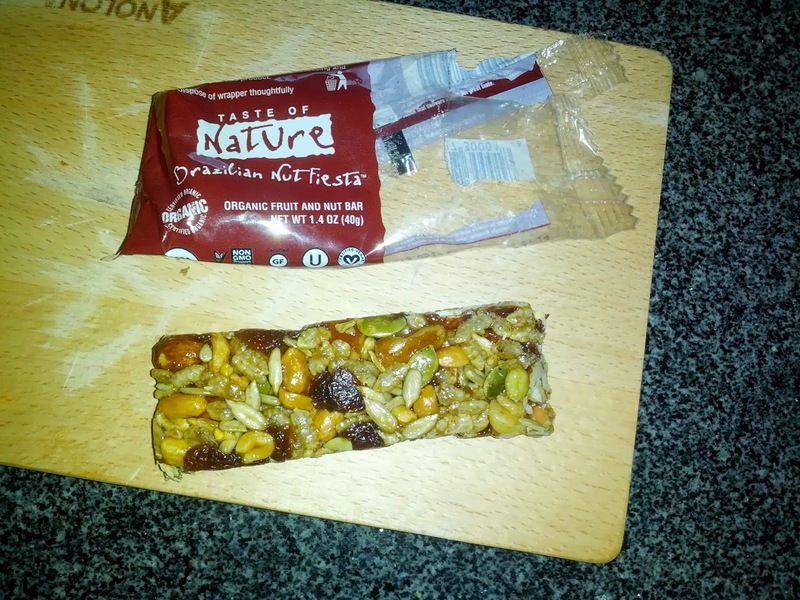 The bar is fairly bitter, dominated by the seeds. No spicing. Definitely not my thing, and I wasn't inspired to try any more of their products. You may remember my review of Prima Cafe a long time ago. They serve my absolute favorite frozen yogurt in the city. But, they are also open for breakfast and lunch, and have a good looking baked goods selection in the morning. You know I love breakfast baked goods, but Prima was originally only open Monday through Friday, so I never had the chance to try them. Until now, as they recently added Saturdays hours too! Prima Cafe sources their baked goods from City Baking Co, so I quickly looked up the offerings online. 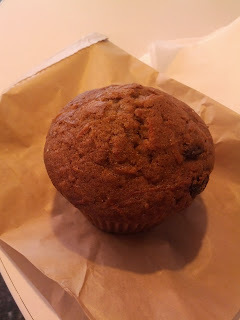 I've sorta been on a scone and muffin kick, so I was excited to try them out, since I know many cafes use City Baking Co, and some of their products sound quiet tasty. City Baking Co makes a large variety of scones, including glazed options, like a maple walnut scone with maple icing or an iced lemon curd scone. Or, equally delicious sounding, but slightly less decadent, scones with other toppings, like a brown sugar crumble topped apricot scone or an almond and sweet crumb topped raspberry scone. Mmm! They also have a host of standard fruit scones (strawberry, ollalieberry, currant, pumpkin, etc), and low-fat versions as well. I was of course excited for one of the topped ones, but Prima Cafe only carries two varieties: cranberry or blueberry. Both standard scones, no topping, not fun. But perhaps more breakfast appropriate. Since I never like dried cranberries, I went for the blueberry. It was an incredibly boring scone. It wasn't bad, but there was just nothing to it. Slightly dry, but not too bad. The blueberries were all in a layer in the middle, tiny Maine blueberries, and really just had no flavor, and didn't add much moisture. The base had no flavor. I would have loved some buttermilk tang or something. The top was equally boring, it could have used a sugar topping, or something. 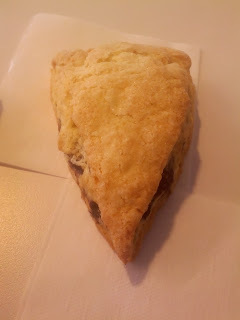 This was a large scone, a good price for $2.25, and clearly fresh, but just really boring. Would not get again. Since I didn't care for the scone, on my next visit, I went for a muffin. Just like the scones, City Baking Co makes a slew of muffins that sound fantastic. Mixed berry with a brown sugar topping! Raspberry and almond filled with a crumb topping! But alas, Prima Cafe also did not carry any of those. They really seemed to be picking only the healthier options. I settled on the carrot muffin, having fond memories of my mom's carrot cake. Rookie mistake: bad idea to order something when I wanted it to be something else. Described as: "Made with freshly grated carrots, pineapple, and coconut this flavor packed muffin is sure to give your morning a “kick-start”." It wasn't a very good muffin. It wasn't dry, but it also wasn't moist. Just a very consistent, boring doneness. It was loaded with plump sweet raisins, and a few tiny bits of pineapple. The whole thing seemed very oily. It wasn't very spiced. This really seemed like it should be better than it was. Maybe I just wanted it to be my mom's amazing carrot cake. I dunno. I would not get again, but the price was right for a large muffin. On my final visit, I decided to give them one more chance, and tried the final baked goods category: croissants. I went for the most decadent looking, the almond croissant. 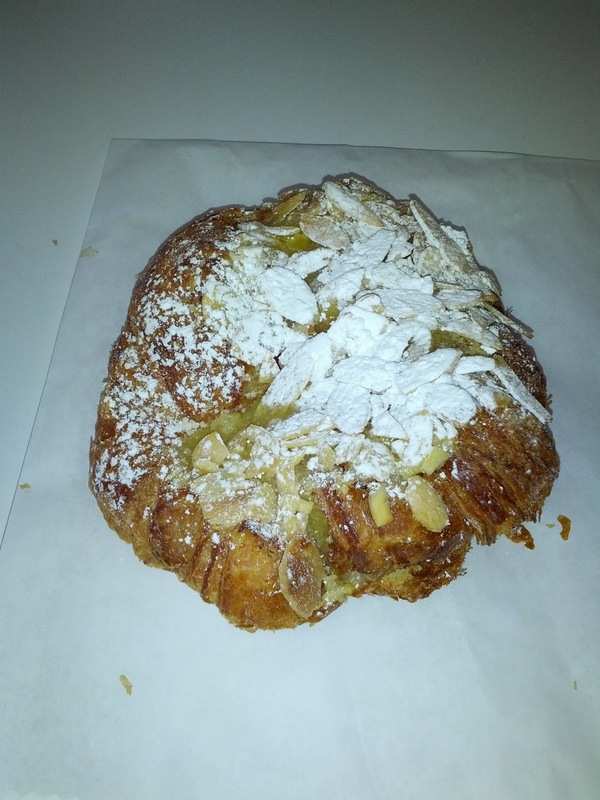 It was a classic croissant, stuffed with almond paste, topped with sliced almonds, and covered in powdered sugar. It seemed like it might have been baked without the filling, and then had it added in later, as the croissant was physically sliced in half. That didn't quite make sense to me. Maybe Prima sliced them? I'm really not sure. Anyway. It was also a monster. We have little almond bear claws at my office that I have at breakfast sometimes, and I think I could have fit ... 6 of them in this thing. HUGE. The croissant itself was good enough, a bit moist, a bit flaky, a bit crispy. Not remarkable, but better than most generic croissants. There was TONS of filling. It originally looked like way too much to me, but I liked the filling so much that I didn't mind. Almond paste, sweetened. But wow, there was a lot of it. The slivered almonds on top provided some crunch, and powdered sugar sweetened it further, and made it that much more messy to eat. Overall, not amazing, and I certainly wouldn't go out of my way for it, but it was good enough, and quite satisfying. I'd get another if I wanted a sweet treat that I was pretending to be acceptable for breakfast. It went very well with my black coffee. And $2.50 is a fine price for such a beast! Last week, I reviewed Roka Akor, not for the experience of dining at the restaurant, but rather, for the incredible takeout sushi we had delivered one night at my office. As I said in that review, there really does not exist better takeout sushi in San Francisco. But takeout is not what Roka Akor does. They are a fine dining establishment. Since being blown away by the takeout, I've been wanting to go to the restaurant for a real meal. Known primarily for their pricy decadent omakase, I've been eager to also try out their more affordable option: lunch. But, lunch is only offered weekdays, and I'm provided lunch at work. It took some time for the opportunity to come up, but finally, on President's day, I was able to visit at lunch time. At lunch, the regular a la carte menu is offered, but the incredible value lays in the business lunches. Your choice of several appetizers, a main dish, rice, and miso soup, for only $22. The appetizers included are normally priced at $12-18 and the mains $18-24. The portions do not seem to be reduced sizes, and the choices are good ones. This is a crazy good deal. I even think two people could split one of these meals for a lighter lunch. 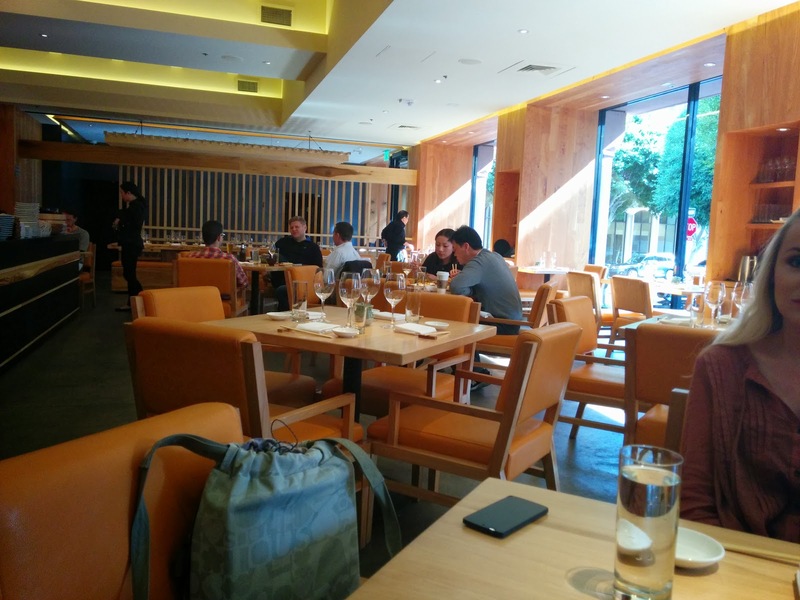 If you'd like to check out Roka Akor, and don't want to commit to a pricey dinner, I highly recommend trying the business lunch. It is an incredible amount of quality food for the price. I don't think you can do better than this for a full sit down lunch in the Financial District. I'm still a bit stunned. Next, I'm really going to have to splurge and go for a real dinner. 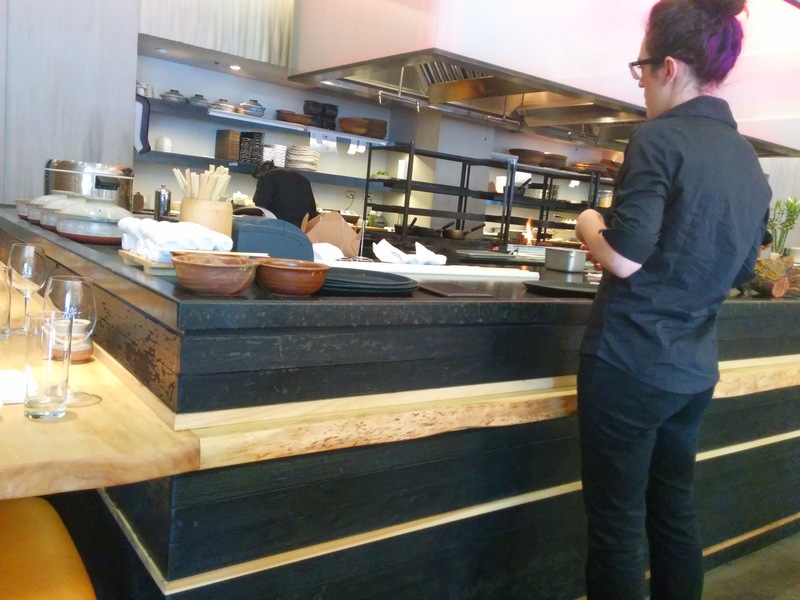 The space is very open, including the kitchen, where you can watch food being cooked over the open flames. Bright room, large windows, blond tables. During the day, it is very bright and airy, with large windows and plenty of light. No idea what the ambiance is like at night, but it was lovely by day. The table was set with white napkins, but when Emil arrived in a black suit, his napkin was quickly switched out for a matching black one. Attention to little details like this were very surprising, particularly for a lunch service! One thing we all noted is that we were not provided warm towels to clean our hands before the meal. We had just returned from Tokyo, so perhaps we were expecting this more than a regular diner. Fairly standard practice for Japanese restaurants even in the US though, isn't it? Our lunch sets all started with miso soup, normally $4.50. I didn't care for it, but I'm not a soup girl. 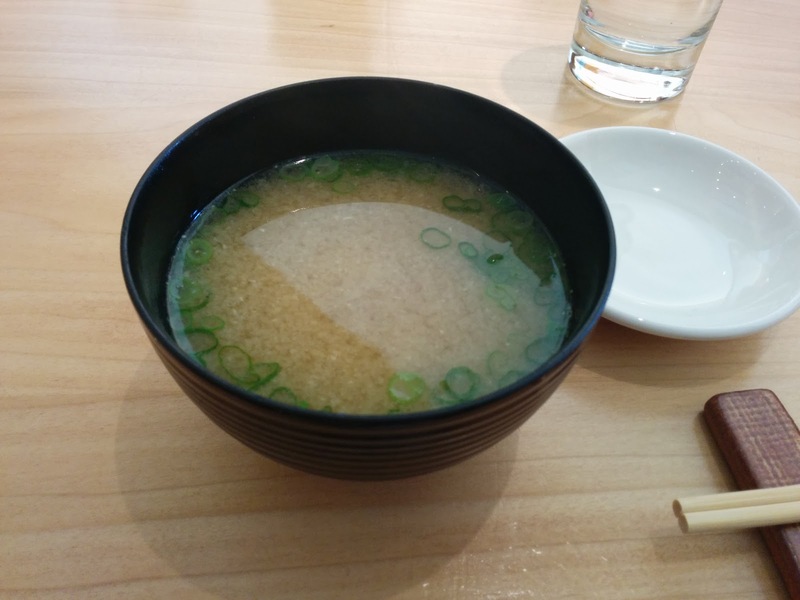 Very standard miso, and both the tofu and green onion inside seemed a bit overcooked and mushy. I wouldn't order it again, but as part of my lunch set, it was fine. Santa Barbara Uni with Lime, Daikon Sprouts and Chicharrones. $15. Emil decided to order one additional appetizer, the uni. Because, when there is uni and chicharrones on the menu, how do you not? 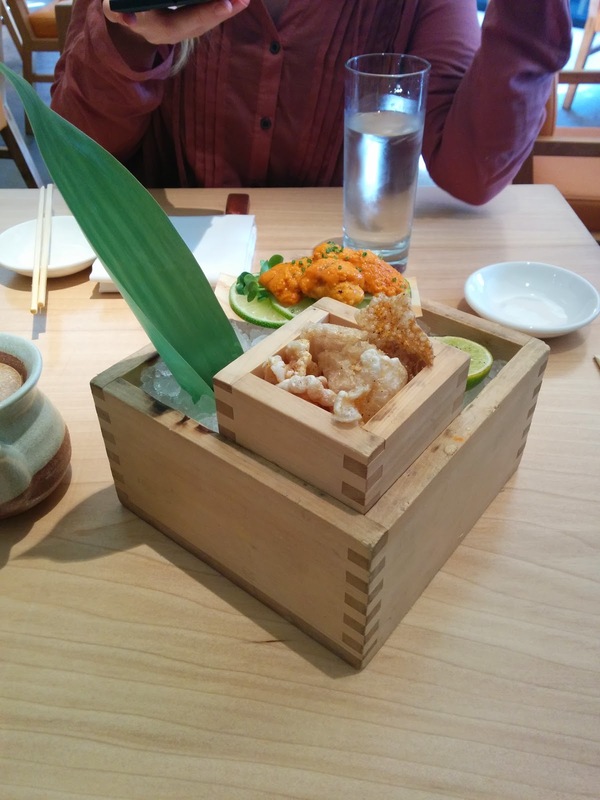 The presentation was stunning, served in concentric wooden boxes. The outermost one contained ice. Inside the smallest box was the chicharrones, not exactly something I've ever had with uni before, but the bacon-y flavor does work well with uni. They were super crunchy, and a very fun item to put the uni on. Alongside was grilled lime, and a squirt of lime juice helped liven everything up. The uni was either from Santa Barbara or Mendocino, I'm not sure which, since I'm pretty sure we were told both. It wasn't my favorite. It was creamy, and I think pretty fresh, but had a bit of funk to it. I think I've realized that I really prefer Hokkiado uni, which is unfortunate given that I live in the Bay Area. 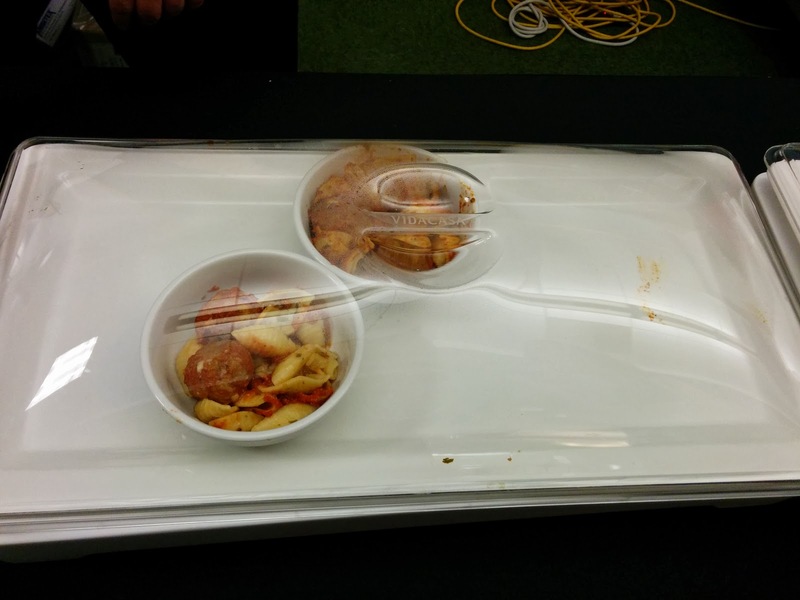 The $15 price for a stunning presentation and generous amount of uni was fine. Yellowtail Sashimi with Shallots and Poached Garlic Ponzu. For our appetizers, we all picked the yellowtail sashimi, although the other options were a butterfish tataki or beet salad. 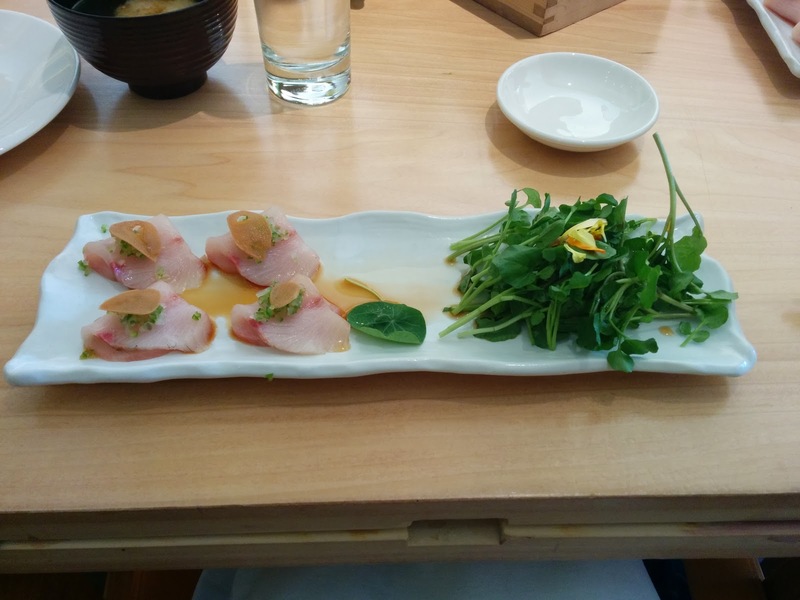 I really liked the butterfish tataki when I had it before, but I was trying to mix it up and try something different. And who picks beets when there are raw seafood options? We each received 4 generous slices of yellowtail, drizzled with ponzu, topped with some sort of onion based gremolada and crispy garlic slivers, and served with a side of greens, I believe watercress. The fish was fresh, and I liked the delicate ponzu, but, I remembered at this point that I don't really like yellowtail that much. Whoops. I really wished I had picked the butterfish, since I knew I had enjoyed it so much before. The onion in the gremolada was a bit too harsh, contrasting sharply with the delicate fish. The greens were too bitter for me, particularly without a dressing. My dining companions enjoyed their dishes, and it was fresh fish, this just wasn't quite for me. Normally $18 when ordered separately, which is a bit high for 4 slices of fish, but included in the set lunch it was an incredible value. I'm feeling like a broken record here, but it is worth repeating. Salmon Teriyaki with Pickled Cucumbers. For our mains, we could choose between a beef dish, very tempting sounding miso black cod skewers with mizuna salad, or salmon teriyaki. Normally, I'd order the black cod in a heartbeat, as I love black cod, and I love miso, but I just had miso black cod two days before. Hard life, I know. So I went for the salmon. The portion size was insane. A huge, huge filet of salmon. Well roasted, tender, flaky, but fully cooked. I prefer my salmon mid-rare, but I know that is hard to achieve over a grill, and I didn't specify how to cook it. It had incredible crispy skin on top and was served wrapped in a grilled leaf. The salmon was lightly glazed with teriyaki, with a separate container of additional sauce provided to dip into as you ate. Which, I did regularly. It was sweet and delicious. Emil, who doesn't eat sweets, was happy this was left on the side, as he could ignore it completely. His loss! The pickled cucumbers on the side I didn't love, they were a bit mushy, and not very acidic. We were also all given a small bowl of rice, unremarkable, a bit mushy. None of us really touched it. One of my dining companions did pick the miso cod skewers, so I got to try a bite of them as well. 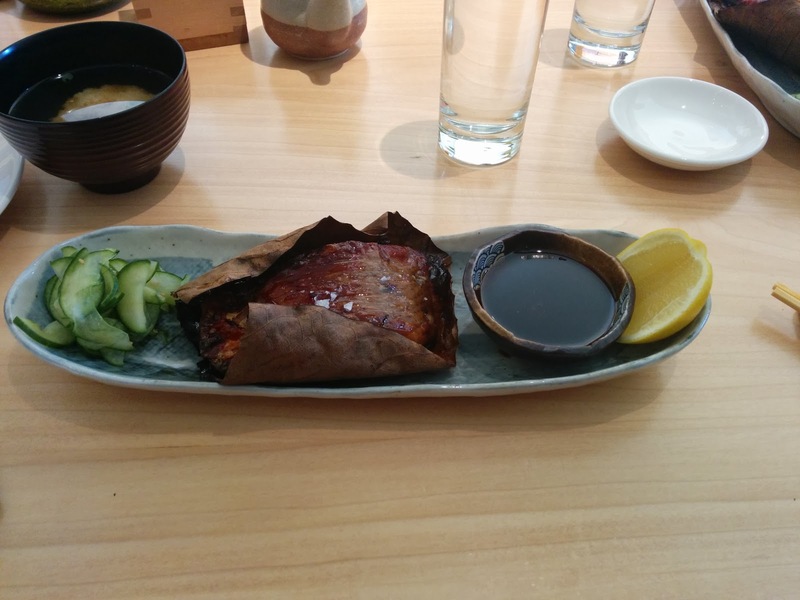 The cod was tender, beautifully cooked, and the miso glaze was absolutely delicious. The serving was also generous, 3 full skewers! If I were to get the business lunch again, I'd likely go for that option, although the same was quite good. The salmon is normally $24, so the value as part of the lunch set is totally insane. First, let me explain something. Dobbs Ferry is not a caterer. They are a regular full service restaurant and bar located in Hayes Valley, open for happy hour and dinner, and weekend brunch. But, at my office for the past month, we've been getting catering once a week from Dobbs Ferry. I'm not entirely sure why, I think it was a bit of a promotion for the restaurant, and a chance to just give us something a bit different. I'm not sure how much catering they normally do. I was intrigued by the name, so I looked it up. It turns out, Dobbs Ferry is the name of a village in New York, the hometown of the owner. Thus, the restaurant concept is Californian bistro, with east coast influence. So, I'm not reviewing Dobbs Ferry the restaurant. I've never been there. And I know judging a restaurant based on its catering is not fair. Catering is rarely that good. But I did try a lot of their offerings, and I cannot recommend it, at all. On the first day of catering, they provided a salad, and a choice of two entrees, one vegetarian. 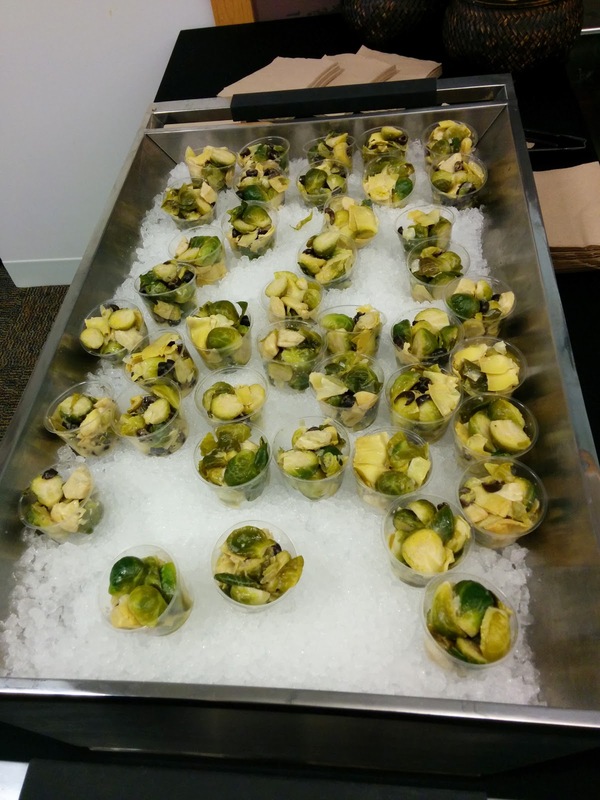 The salad was just a mix of brussels sprouts and artichoke hearts, with very mild, olive oil based dressing. The vegetables were cooked well enough, not mushy, but no flavors really popped here. The dressing really needed ... something. For entrees, we had the choice of Pete's Meatballs & Conchiglie or Vegetarian Stuffed Shells. I like both of these dishes, so I was hard pressed to decide. In the end, I went for the meatballs. Described as "pork and beef meatballs braised in tomato sauce", they are available on the menu at Dobbs Ferry in various forms, as a meatball sandwich, or over orzo. In our case, they were served over cute little conchiglie. The meatballs were a large size, very moist, a mix of beef and pork. Not bad. Not earth shattering meatballs, but solid enough. But the pasta was overcooked and mushy. Perhaps a side effect of being left in a hot box for catering service? I could overlook that, except that the "signature marinara sauce", that appears in many of their dishes was not very flavorful, and really no different than canned tomato sauce. I kept wanting to like it more than I did, since the conchiglie were just so cute, but besides the decent meatball, it was a pile of flavorless mush. On our next catering day, we had garlic bread as the side dish, again with a choice of entrees, one vegetarian. The garlic bread wasn't bad, for what it was. The bread itself is from La Boulange, and it was a brioche-like baguette. Nice level of crispiness. Great choice for garlic bread. But, it was covered in oil, on all sides. When I picked it up from this napkin, it had soaked through all layers! The topping was butter and garlic, and quite good. Very oily, but the flavor was there. 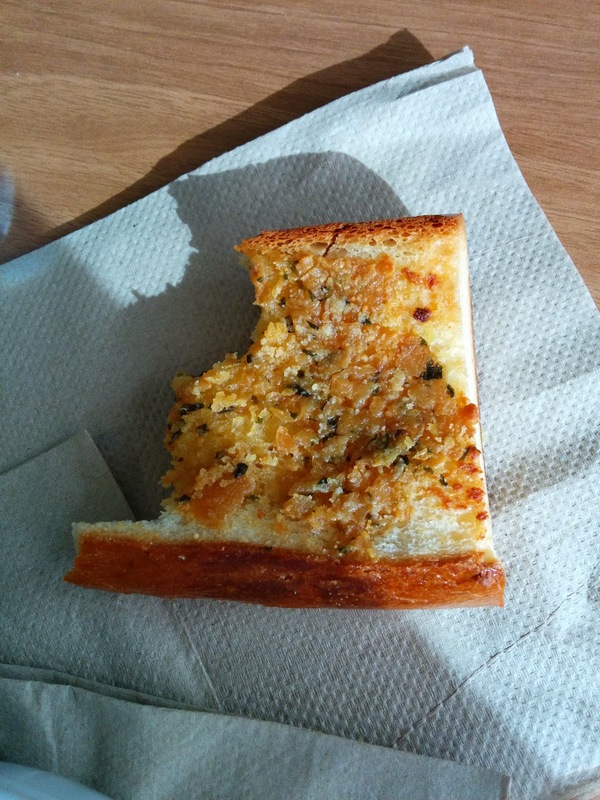 For this particular style of garlic bread, it was good, but I didn't want more. Really, just far too much oil for me. But I did enjoy scraping the garlicky topping off, and I appreciated their bread selection. For entrees, we could select between sausage & peppers, or eggplant parmesan. One of my co-workers beat me to the pickup spot, and got the sausage & peppers: "Italian sausage seasoned with fennel, caramelized onions and roasted red peppers." He took one bite, and declared it horrible. He is someone who we make fun of for liking EVERYTHING, so to hear him say something negative about food was enough to convince me to go no where near it. Plus, it was pork sausage, something I'm never a fan of, and was covered in their same marinara as the last dishes. 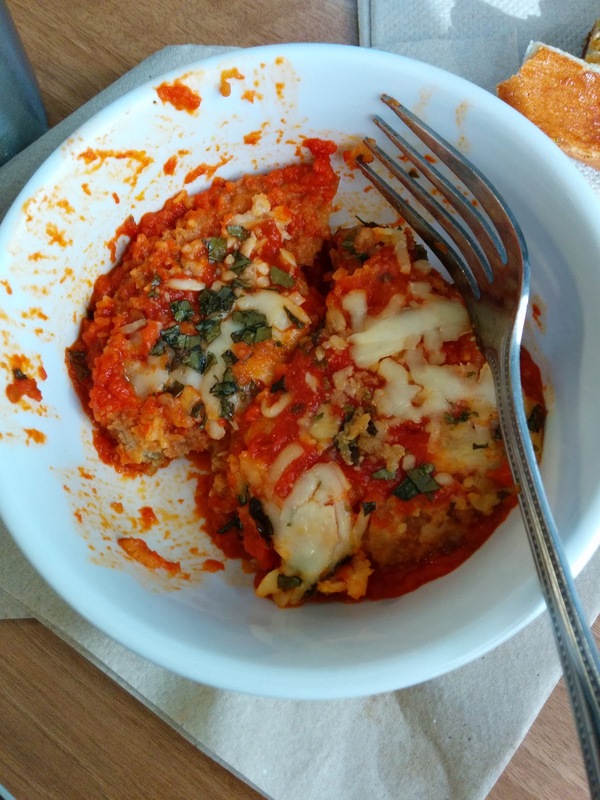 So I got the eggplant parmesan, which is offered on their regular menu: "breaded eggplant filled with spinach, ricotta, and parmesan cheese and baked in marinara with a parmesan crust"
This dish reminded me exactly of the meatballs, in that the dominant flavor was the sauce. And the sauce was not very good. Really, most canned tomato sauce is tastier than this. I don't understand it, as this is their signature sauce, and is an integral component of many of their dishes (in fact, part of every dish they offered us). The eggplant was soggy, the breading oily and mushy. Yes, it was catering so it was just sitting in a hot box, so I can't expect it to be crisp, but it was really quite bad. Just like the pasta in the previous dish, a pile of mush. And just like the garlic bread, way too much oil. And you already know how I feel about the sauce. The congealed cheese on top didn't help things. The final dish I tried was the side of potato salad. 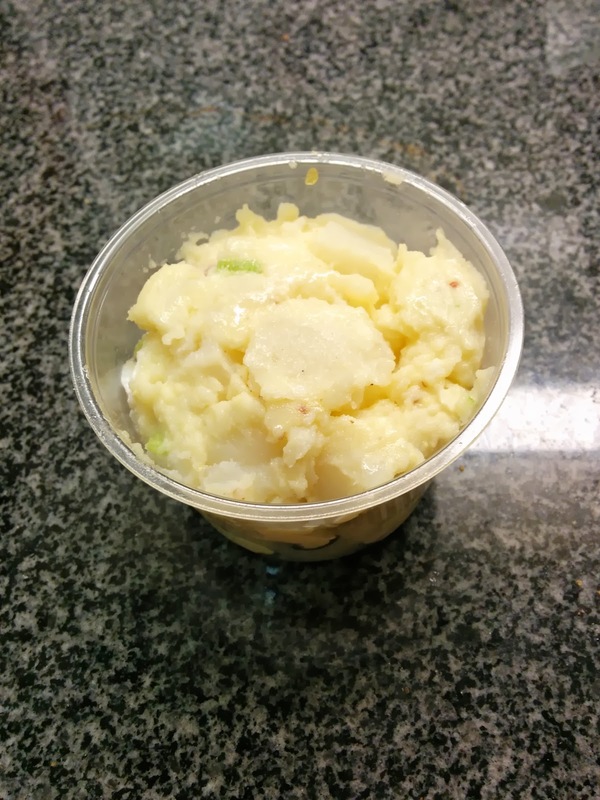 I love my deli salads sometimes, and I was really in the mood for potato salad when I tried this. But ... I didn't like it. The potato was overcooked, fairly mushy. This time I can't blame the hot box for the pushy product. The dressing was creamy, but far too heavy on the mustard for my liking. There was a lot of raw red onion bits in it, too sharp. Celery for some crunch was nice, bits of egg also good. But overall, not a winner.